Cheirolophus crassifolius (Bertol.) Susanna, Pl. Syst. Evol. 214: 157. 1999. Centaurea crassifolia Bertol., Ann. Storia Nat. 2: 359. 1829. Centaurea spathulata Zerafa, Fl. Melit. Thes. 1: 11. 1827, nom. illeg. non Centaurea spathulata Ten., Fl. Napol. 1: LI. 1811. Palaeocyanus crassifolius (Bertol.) Dostál, Acta Bot. Acad. Sci. Hung. 19(1–4): 74. 1973. Centaurea nitida Naldi ex DC., Prodr. 6: 601. 1838, nom. illeg. non Centaurea nitida Lam., Fl. Franç. 2: 49. 1778 publ. after 21 Mar 1779. Susanna, A., Garnatje, T. & Garcia-Jacas, N. 1999. Molecular phylogeny of Cheirolophus (Asteraceae: Cardueae-Centaureinae) based on ITS sequences of nuclear ribosomal DNA. Plant Systematics and Evolution 214(1–4): 147–160, DOI:10.1007/BF00985736. 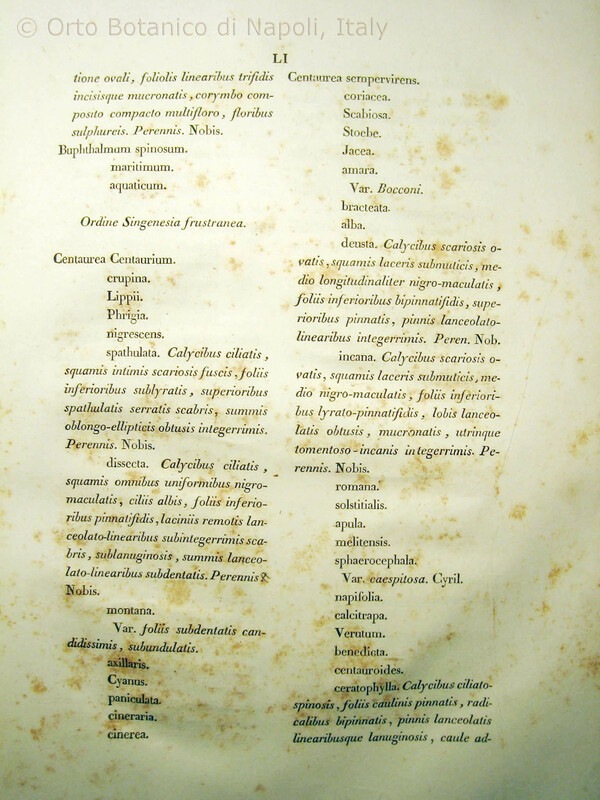 Reference page. Hassler, M. 2018. Cheirolophus crassifolius. World Plants: Synonymic Checklists of the Vascular Plants of the World (version Mar. 2018). In: Roskov Y., Abucay L., Orrell T., Nicolson D., Bailly N., Kirk P., Bourgoin T., DeWalt R.E., Decock W., De Wever A., Nieukerken E. van, Zarucchi J., Penev L., eds. 2018. Species 2000 & ITIS Catalogue of Life. Published on the internet. Accessed: 2018 May. 13.
International Plant Names Index. 2018. Cheirolophus crassifolius. Published online. Accessed May. 13 2018. The Plant List 2013. Cheirolophus crassifolius in The Plant List Version 1.1. Published on the internet. Accessed: 2018 May. 13. Euro+Med 2006 onwards: Euro+Med PlantBase – the information resource for Euro-Mediterranean plant diversity. Cheirolophus crassifolius. Published on the internet. Accessed: 2015 July 12. For more multimedia, look at Cheirolophus crassifolius on Wikimedia Commons. This page was last edited on 14 March 2019, at 17:54.